Fewer concepts in American society have received more attention recently than the need for skilled crisis intervention. Images of crises inundate internet and newspaper headlines, television screens and mobile devices. As a result of the growing amount of acute crisis events portrayed in the media that impact the lives of the general public, interest in crisis intervention, response teams, management, and stabilization has grown tremendously. Skills and methods to effectively manage acute crisis situations are in high demand. While many claim to understand the rapidly growing demand for effective crisis management, few provide clearly outlined step-by-step processes to educate and guide health and mental health professionals. This is a thorough revision of the first complete and authoritative handbook that prepares the crisis counselor for rapid assessment and timely crisis intervention in the 21st century. 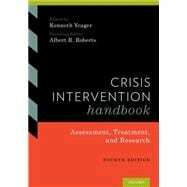 Expanded and fully updated, the Crisis Intervention Handbook: Assessment, Treatment, and Research, Fourth Edition focuses on crisis intervention services for persons who are victims of natural disasters, school-based and home-based violence, violent crimes, and personal or family crises. It applies a unifying model of crisis intervention, making it appropriate for front-line crisis workers-clinical psychologists, social workers, psychiatric-mental health nurses, and graduate students who need to know the latest steps and methods for intervening effectively with persons in acute crisis. Kenneth Yeager, PhD, LISW, is the Director of Quality and Operational Improvement for The Ohio State University Harding Hospital, Administrative Director of The OSU Harding Hospital Outpatient Psychiatric Clinics, and Clinical Associate Professor in the Department of Psychiatry, The Ohio State University. Albert Roberts, PhD, was Professor of Social Work and Criminal Justice, Rutgers University.